The chart above shows the split of points between stage races and one day races for the UCI World Tour in 2013. Out of a total of 16,664 points available during the season, 69% are to be won in stage races. This is disproportionate on a calendar of 154 days of racing where stage races account for 140 days or 91% of the calendar. Is this a bias for stage races? Who gains and who loses? And what do smaller teams do when they decide how to spend their budget on riders or deploy tactics on the day? To start, a quick reminder that the points in discussion here relate to the UCI World Tour and not the full pro calendar. Also the total of 16,664 points is not set yet because the configuration of some stage races is not known and there are no points for a team time trial stage. So don’t count down to the last point but the relative percentages mentioned below remain the same. What can we tell from this? Well 50% of the points available in 2013 are for the overall classification. Remember this is not just for the winner but for the top-20 in a grand tour and the top-10 in other stage races where the winner collects the most points but others can accumulate points. One obvious point is that every rider needs to work on their time trial skills. Should a rider get in a lucky break one day and gain time to leap up the overall rankings then they need to be ready for the time trial stage in order to defend their position. A few places lost on the day can mean lost points that count by the end of the season. Similarly teams should be checking out every time trial stage matters, even scoping the route for the lesser events can pay dividends and it’s an investment that costs less than hiring riders. With arithmetic like this we can see why riders prefer to play a long range game in a stage race. Looking at the mix of points, what about the type of rider? Here things are more even, albeit with a bias to the stage race specialists. 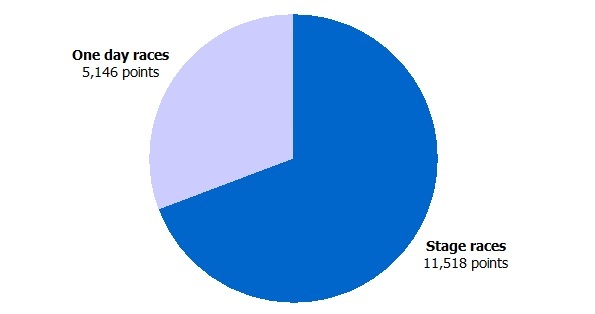 Over the year 50% of the World Tour points are awarded to the GC of stage races with the remaining half of points going to one day races (30%) and stage wins (20%). A one day classics specialist like Tom Boonen, Philippe Gilbert or Fabian Cancellara can aim to grab a share of the one day points plus those available for stage winners. But a stage race specialist like Bradley Wiggins or Joaquim Rodriguez can aim for more with a high overall position plus placing well in stages along the way and that’s why they top the ranking tables. But there’s a second element here in that placing several riders in the top-20 of the overall can matter more. Big teams can win big but those lower down have to fight for their chances, whether it’s winning, TV airtime or points. Take Radioshack in the Tour de France. They won the team prize and got to stand on the Champs Elysées podium but they also got 166 points by placing four riders in the top-20 (Zubeldia, Kloeden, Horner and Monfort), something that helped the team considerably given the disappointment suffered by the Schleck brothers and Fabian Cancellara. Now we didn’t see this riding on TV so much but it brought Radioshack more points than a second place on the podium. Cycling is often about emotion and passion. When I picked a highlight of 2012 the first choice was Thibaut Pinot’s Tour stage win as Marc Madiot roared encouragement from the team car. But cycling is business too and I’ve been exploring how teams can get value for money: Moneyball into Moneywheel. All this might horrify some readers who to see a show, and team managers like Marc Madiot with his Dantonesque love of audacity. For example the logic here suggests the dismal tactic of a “mountain train” dedicated to pacing a rider into 14th place rather than trying for glory. But it doesn’t have to mean the pre-race team briefing is replaced by a spreadsheet. Instead you can race as boldly as you want but if the plans don’t work, back them up with the means to secure some points, especially if you’re on a modest budget. This way you can go for glory but also hope to retain your spot. Now that’s all easier said than done, half the peloton is trying to win points. But if we know the points, we know the hidden incentives. Half the season’s points go to rewarding the overall classification of stage races meaning consistent riders can quietly pick up points all season long even if they don’t show up too often in front of the cameras. There are riders who are only a few watts short of being in the front group in the mountains but many fans would not know them if they walked past them on the street yet these riders can be better paid than others we might see in breakaways or even on the podium a few times a year. Teams count every point and can pay large amounts to hire riders with enough ranking points to keep them in the top tier. But some seem to be missing a few homegrown tricks like scouting time trial stages or giving up half the team on the day to work for the team sprinter only to miss the top-5 altogether. None of this is why we tune in to watch a race on TV, tolerate a jumpy pirate video stream or trek up the side of the mountain to watch a race. But it can explain what is going on in front of us whilst we watch. Having looked at this topic twice in a week it seems to scratch the surface. Yes, but, teams won’t necessarily have financial resources to buy riders with points, if they don’t have a sponsor. Sponsors thrive on publicity. 14th place on GC does not give much publicity, even though it gives points. 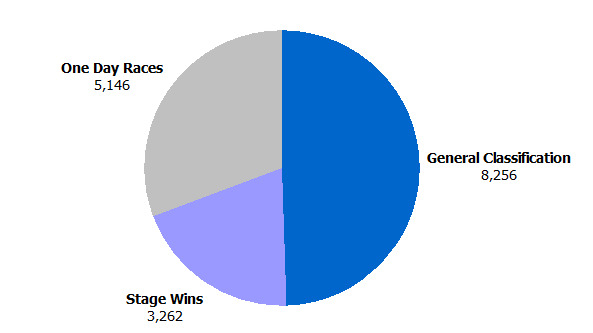 Compare this to the publicity value victories bring, be they one day wins, stage wins or GC. Some teams must ultimately decide whether to be slaves to points or slaves to their sponsors. Sure and the post is based on the points system rather than the wider context although you put it properly in context. Ag2r are a good example, they’ve tried the spreadsheet by hiring Iranians and pacing Nicolas Roche around France and Spain and now they are going the other way with Pozzovivo, Betancur and others. I suppose the purpose of my comment was along the lines of it would be nice if the UCI recognized this fact, and aligned interests much better. The whole point of the World Tour for the UCI was to be able to lock in big sponsors for the sport in general, and to provide a stable platform. But in essence they have defeated this by having riders chase points, and team chase riders with points. Of course this has all been stated in this forum many times previously. Nice analysis, but pie charts are the worst! Am I right that there are no UCI points for other jerseys in Stage races, such as green or polkadot etc? That seems a bit silly if it is the case as riders of different styles could be encouraged to win these types of things. I also think it is very sad that winning a race such as Paris Tours counts for nothing whereas a stage win in the TDU next month or Tour of Beijing a couple of months back accounts for a lot. Yes, this is true. There are no points for these competitions at the end of a race nor is there a daily “rent” for the rider with the jersey. Confusingly there is for the second tier Pro Conti races. Ahhh, exactly the question I posed to you earlier this year re: a points ‘rent’ for jersey leaders. Bizarre how Pro Conti races have it but not WT. Not that we needed more evidence of a system with more holes than the Titanic. Great article…. and I understand your point, BUT, Eddy didn’t worry about no stinking points. And yes, there is a point to be made here. Maybe, just maybe, the whole “points” thing is fundamentally flawed. Sometimes we get to a bad place unintentionally. We take half steps that make sense at the time but somewhere down the road we find ourselves scratching our heads and wondering how we got there? The whole points thing is a perfect example. You must have missed the Mapei 1, 2 and 3 at Roubaix in ’96. Or all the dopers that won Liege (look at the ‘winners’ list, it’s frightening). I’d post as anonymous too if I was going to make such a poorly researched comment. Thorough analysis. But as touriste-routier already mentions, in the end it’s about airtime. For sponsors, and thus for teams, the only thing that counts about the points is that they need enough to get a guaranteed spot in the WT races. It really doesn’t matter if they’re 3rd or 13th in the point ranking. Once they make that mark, it pays to risk a lot for a stage win. The winner is mentioned in the general media and generates a lot of exposure. Also for individuals, the points have limited value. Sure, to get hired by Ag2r or other teams at the bottom it helps. But Omega or Sky are going to hire people for their added value to the team tactics or individual winning potential, they have points aplenty. That said, it never hurts to scout a tt route in a big race when you’re competing for gc, not doing so is just so unprofessional. Some really good/interesting points, and surely also the proof that, as AK says, if you’ve got a GC rider like Roche, it doesn’t mean you can’t have people in breaks or go for wins, as long as it doesn’t compromise that. You could have a few domestiques with Roche up the mountain and someone away up front, with airtime, and coverage, with your GC rider coming in 15th on the road and staying in the top 10. I think it’s just another part of the fabric that makes up stage races, and makes it even more interesting for fans, when you’re not just looking at the top 5, the winner, the break, but also the GC. For me, the top 20 list is always as intriguing at the end of each day as the day’s podium. It just seems daft that the other jerseys don’t get some points. KOM in the Grant Tours at least require a lot of effort that appears to be unrewarded, especially as the riders aren’t in the top 10, certainly for the green.